From the coast to the mountains, from sea to crag, from sandy beach to shady Mediterranean forest – the diverse and changing natural landscapes of Catalonia exert a powerful attraction to adventurers. We believe this is the best family activity holiday and adventure holiday in Europe. 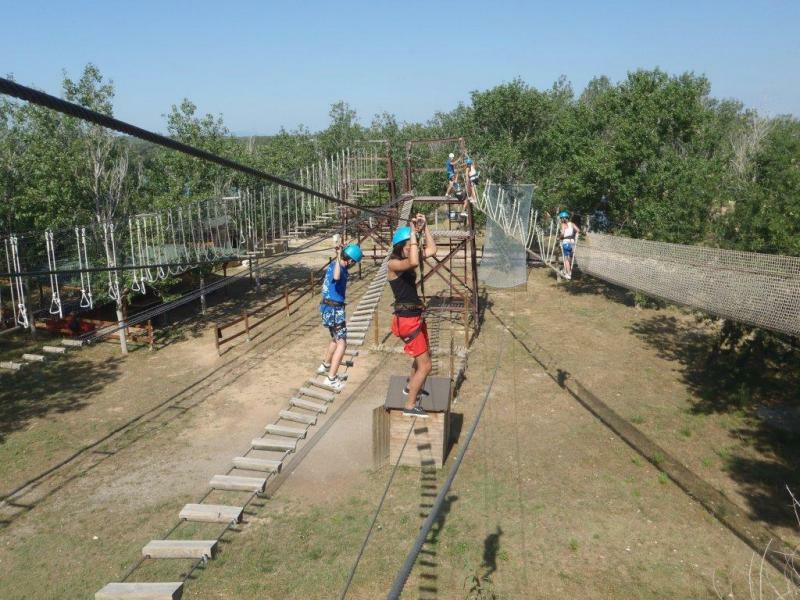 Our activity holiday and adventure holiday has been specifically designed to reveal many aspects of this beautiful part of Catalonia!! Level: Families (children 6 or older). 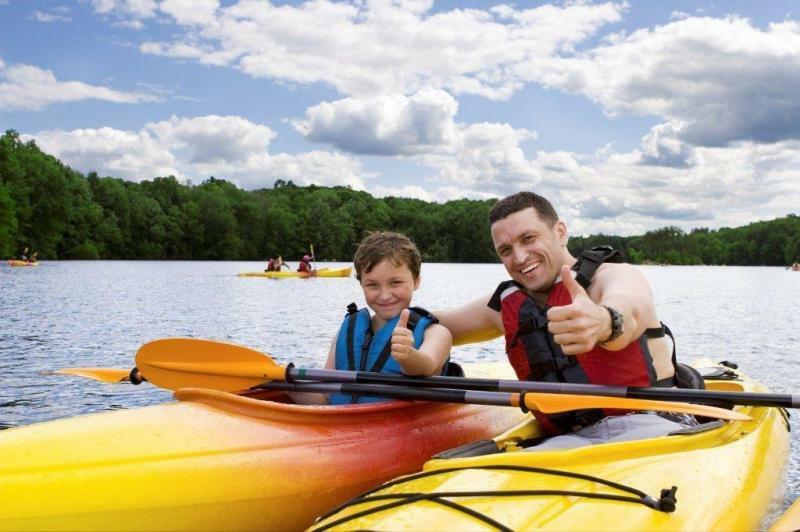 No experience is required for any of the activities on this holiday. Accommodation Your accommodation is a charming family run hotel dating from 1924. It offers fantastic views from its terrace over Empordà and the beautiful Bay of Roses. The outdoor pool is set in the former Sant Agustí Convent, 100 metres from the hotel. The hotel restaurant specializes in traditional Catalan cuisine, which is served on the terrace or under the arches of the dining room. Breakfast is served on a roof terrace with beautiful views. There is also some time to relax on the beach or, for the more adventurous, why not try a tandem skydive?! If you are after some culture, then perhaps take a trip to Figueres and the Salvador Dali Museum or visit the Greek/Roman ruins at Empuries. Day 1, Transfer to your accommodation in Castello d’Empuriès: Arrive at Girona Airport (1 hour transfer) or Figueres or Figueres Vilafant Train Station (20 minute transfer) if you have flown into Barcelona, where you will be transferred to your accommodation in the medieval village of Castello D’Empuries. Castello D’Empuries is a beautiful medieval village rich in culture and steeped in history. There are many historical buildings to visit; however the landmark of the village, visible from afar, is the Parish Church of Santa Maria which is often called the “Cathedral of the Empordà” because of its size and Gothic influenced architecture. There are many great restaurants and bars within a short walking distance from your accommodation, the village never fails to seduce you. Accommodation: Your accommodation is in a charming family run hotel dating from 1924. It offers fantastic views from its terrace over Empordà and the beautiful Bay of Roses. The outdoor pool is set in the former Sant Agustí Convent, 100 metres from the hotel. The hotel restaurant specializes in traditional Catalan cuisine, which is served on the terrace or under the arches of the dining room. Breakfast is served on a roof terrace with beautiful views. Day 2, River Trekking: Just go with the flow! Equipped with a wetsuit, helmet and harness, under the leadership of our professional guides, you journey safely through a totally awe-inspiring and otherworldly landscape. Immersed in a strikingly beautiful natural environment, you will swim through pools of turquoise water and jump and slide down smooth rocks … Safely guided back you can relax and bath in the sun after a unique experience you will never forget! Day 3, Via Ferrata: Today you will you will spend the day at Cala de Moli in Sant Feliu de Guixols. Latin for ‘iron way’, a via ferrata is the bridge between scrambling and climbing. It requires very little equipment, however you’ll need a good head for heights. The via ferrata route is marked out by metal rails, rungs and cables embedded into the mountain. This wonderful adventure takes place in the only via ferrata in the world that runs alongside the Mediterranean Sea with spectacular coastal scenery. Day 4, Free Day (we will provide public transport information): Visit the Dali museum in Figueres, the third most visited attraction in Spain (25 minute bus ride). Visit the beautiful medieval city of Girona (25 minute bus ride and 30 minute train ride). Other activities see below. Day 5, Visit to the Sant Aniol Valley: Today after a 1 hour transfer you will visit the Sant Aniol Valley, you will hike along a dry river bed with beautiful rock formations on either side, you will spend some time swimming, relaxing, jumping off rocks into the river and cooling off. On the way back you will stop over in medieval town of Besalu for some sightseeing and a chance to grab some refreshments. 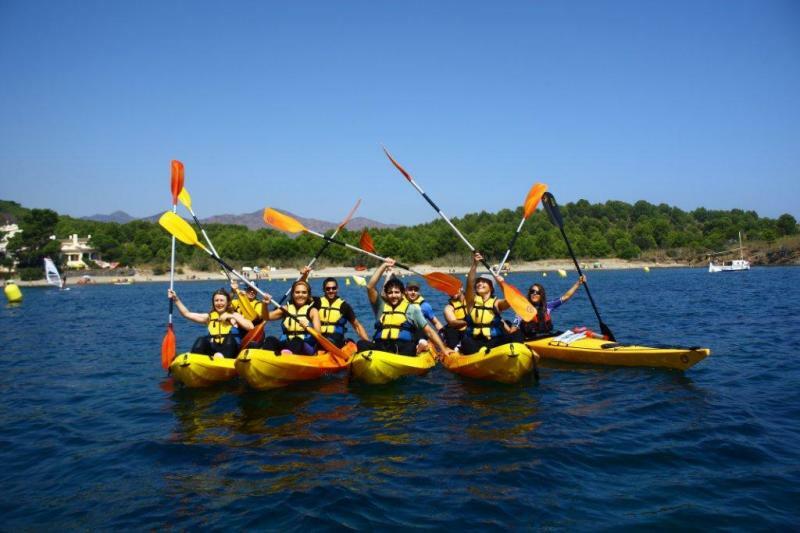 Day 6, Sea kayaking: Today you will journey along the rugged Catalan coast, all the while enjoying the warm waters of the sparkling turquoise sea. This is a fantastic way to enjoy the spectacular coastal scenery and the only way to see some of the most remote and inaccessible parts. In the afternoon you will make your way by road (approx. 30 minutes) to the Monastery of Sant Pere de Rodes and then an ascent by foot to the Castle of Sant de Verdera at the top of the mountain of Verdera, the highest peak of the Sierra de Rhodes, from there you have beautiful views of the Bay of Roses, the Pyrenees, Canigo in the background and the Cap de Creus massif. 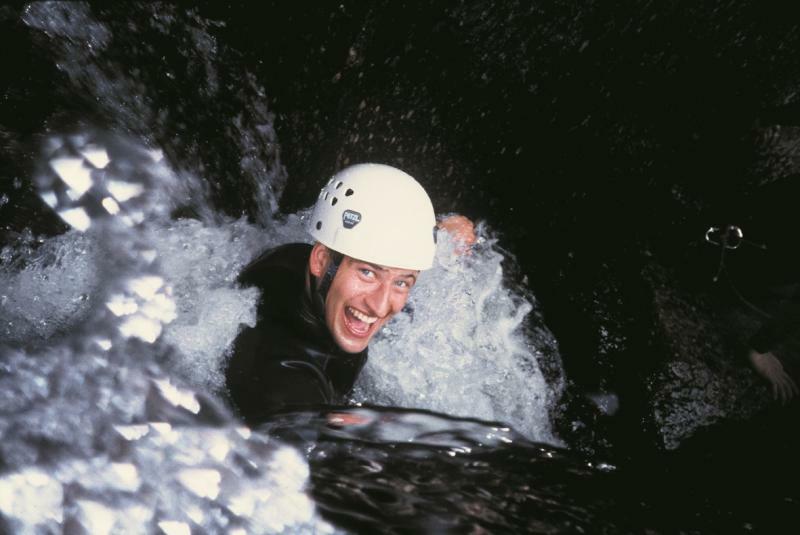 Day 7, Canyoning in France: This activity is perfect for the adrenaline junky, you will travel to France (transfer 1 hour 30 minutes) and the ‘Gorges du Anelles’ , equipped with a wetsuit, helmet and harness you will take on thrilling abseils down beautiful waterfalls with slides and jumps of up to 10 meter and abseils of up to 30m, this atmospheric canyon is overflowing with fun and surprises!… Canyoning is an experience that will positively reawaken and revitalize your senses! Day 8: Pick up and transfer to Girona airport or Figueres Train Station. Note: Each itinerary is planned many months in advance and although it is our intention to operate the itinerary as outlined above, it may be necessary to make some changes as a result of climatic conditions, limitations of infrastructure or other operational factors which are beyond our control. As a consequence, the order or location of overnight stops may vary from those outlined but we will always endeavour to keep you informed of any such changes. Included meals are indicated in the daily itinerary. Spend some time getting wet at a fantastic waterpark with its great wave pool, “Kid’s Lagoon”, twisting slides and relaxing pools. Note. The park is open from 10am to 7pm, the half day starts at 3pm. Taking your own food is not allowed. For the brave members of the family, why not try a tandem skydive, for one of the most memorable moments of a lifetime. You will be attached to the front of an experienced skydive instructor, you will jump out the plane at 12,000ft, freefall for approx. 60 seconds followed by a gentle canopy ride down to the ground. There is no minimum age, as long as you can fit in the harness, they have jumped with as young as 5 year old. Salvador Dalí once famously said in 1920: “I have spent a delightful summer, as always, in the perfect and dreamy town of Cadaqués. There, alongside the Latin sea, I have been quenched by light and colour”. Facing the Mediterranean Sea at the head of a crystal clear bay, the town was a favourite of both Picasso and Salvador Dalí who were drawn to the area’s incredible light and fresh air. Cadaques remains a favourite spot for artists who enjoy the views and the clear air. The Aiguamolls d’Emporda National Park is a nature reserve with coastal marshlands, and provides a perfect location for horse-riding, seeing plenty of birdlife and wildlife during the ride. At any time of year you are likely to spot a variety of birds; with Flamingo and Black Stork plentiful during the spring and autumn migrations. Keep your eyes peeled for wild boar and fallow deer. There are regular flights from many European cities to Girona airport, the closest airport for this holiday, most of which are operated by Ryanair. The transfer from Girona airport to your first accommodation takes approx. 1 hour. There is a wider choice of airlines flying into Barcelona including Ryanair and Easyjet. You need to take the shuttle train to Barcelona Sants from the airport; they leave every 30 mins and take approx. 20 mins. You then change trains at Sants and take a train to Figueres or Figueres Vilafant depending on the train you catch. The transfer from Figueres or Figueres Vilafant to your first accommodation takes approx. 20 mins. The fastest train is the AVANT from Barcelona Sants to Figueres Vilafant , there are approx 9 trains a day, take 53 mins and cost approx. 20.20 euros each way. You can buy the tickets at the station before you board the train. The other option is to take a Regional or MD (Medium Distance) train from Barcelona Sants to Figueres, there are approx. 20 trains a day, they take between 1 hr 50 mins and 2 hrs 10 mins and cost between 11.20 euros and 15 euros each way. Tickets can be purchased at the station before boarding the train. Contact us for a tailored price for a smaller or larger family group.